﻿ North Korea Crisis - Which Country Has the Strongest Military in the Region? North Korea Crisis - Which Country Has the Strongest Military in the Region? Tensions continue to run high on the Korean Peninsula due to North Korea's bellicose posture and increased nervousness among its neighbors. DW takes a look at the military strengths of the main players in the region. Aggressive rhetoric and actions on the Korean Peninsula over the past several months have raised concerns about a potential conflagration. The US government under President Donald Trump has put an end to the "strategic patience" policy pursued by the previous Barack Obama administration. Secretary of State Rex Tillerson has stressed that the military option remains on the table. This month, Washington has once again tightened its already stringent sanctions against the reclusive regime in Pyongyang. China, regarded as the North's only ally, continues to push for all sides to find a diplomatic solution to the problem. But Beijing, too, has apparently increased the pressure on Pyongyang by more tightly enforcing the sanctions regime, for instance by halting coal imports from the North. China's "Global Times" newspaper, known for its nationalist commentary, has been blistering in its criticism of North Korea, accusing it of destabilizing the region and calling for a halt to its nuclear program. But the growing international calls seem to have made little impact on the North. Kim Jong Un's regime has increased the pace of nuclear and missile tests over the past year, and many hold doubts about the ability of the international community to persuade the regime to leave its present course. Experts observed increased activity at the Punggye-ri atomic site hinting at a potential nuclear test soon. Official statements in North Korea's state media stress the country's readiness to wage a "total war" at any moment. Both North and South Korea have been divided by the Demilitarized Zone (DMZ) since the end of the 1950-53 Korean War. The conflict back then ended in an armistice rather than a peace treaty, and the DMZ remains one of the most heavily fortified places on Earth, where two of the world's largest militaries stay prepared for a confrontation. According to an index developed by the Bonn International Center for Conversion (BICC), a German NGO, South Korea is one of the most militarized nations in the world. It ranks sixth worldwide on the index, which was last updated in 2016. North Korea is not ranked in the index due to the difficulty in acquiring and assessing information related to its military. But it's assumed by observers like BICC's Marius Bales that "there is a high degree of militarization" in North Korean society as well. "This is obvious from the fact that they have a 1.2-million strong military for some 24 million inhabitants." Besides the two highly armed Koreas, there are their allies who are also geopolitical rivals. On the side of the North, it's the People's Republic of China and on the side of the South, it's the US. The US-South Korean relationship was sealed in 1953 by a military alliance. In 1961, the North signed a friendship treaty with China and the then Soviet Union, including the provision of military and economic aid. Although Russia later abrogated the military assistance pact, China has maintained it. Another player in the region, Japan, also feels threatened by North Korea. While Tokyo's position in the region is underpinned by its special relationship with the US, its relations with countries like South Korea and China are burdened by its colonial past and World War II legacy. One way of showing the military balance of power in the region is by comparing the number of people in the armed forces in each country as well as the size and scope of the armaments they possess, although such an approach is mired in imperfections. The numbers presented have to be treated with some caution. An annual report on the subject, titled the Military Balance, published by the UK-based think tank International Institute for Strategic Studies (IISS), is considered to be authoritative. It extensively documents the procurement of weapons by various militaries. The figures are partly based on the official data supplied by the countries to international organizations like the United Nations Register of Conventional Arms. But the IISS neither reveals all the sources of its information nor follows a uniform method. It's unclear, for instance, how accurate statistics on North Korea are as the country doesn't release any official data. There is no other alternative, though, says BICC expert Bales. "The Military Balance is the best as well as the only source in this field." However, the expert underlines that the figures represent only the quantity of weapons, but not their quality. To take an example, Bales points out that one heavy tank cannot be considered to be exactly equal in its capabilities to another heavy tank. "A Soviet T-62 tank of the North Korean Army from the late 1960s cannot be on an equal footing with a South Korean K2 Black Panther tank from 2013." The manner in which the comparative strengths of militaries were assessed in the 19th and early 20th centuries has become obsolete, experts say. "Modern warfare and modern weapon systems can't be compared like that," Bales stressed, because today we don't need tanks in equal number to destroy enemy tanks, but can also use drones, helicopters and other aircraft to do that task. Also, the figures do not show details of other critical resources that are required to operate the weapons. North Korea, for instance, suffers from an acute fuel shortage, hindering its ability to operate training aircraft. 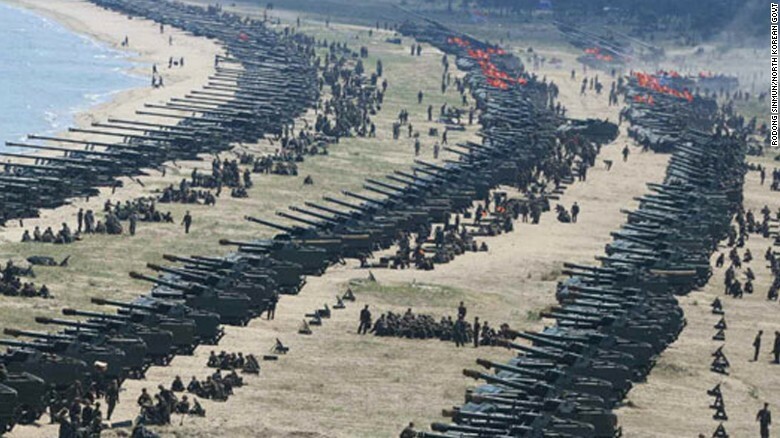 In the case of North Korea, Bales said, "the size of the military stands in contrast to its quality. Its air force, in particular, is obsolete, with its most modern aircraft dating back to the 1980s." South Korea, on the other hand, is equipped with state-of-the-art military gear, thanks largely to weapons deliveries from the US and Germany. 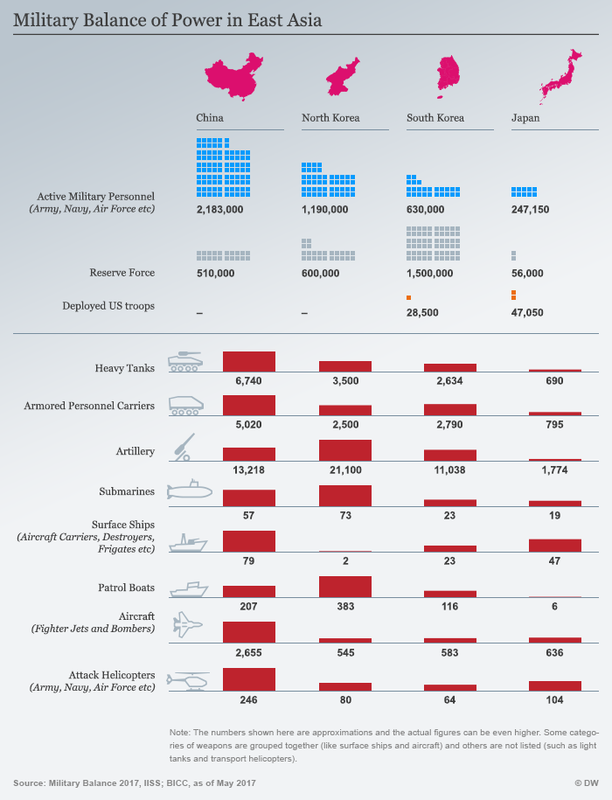 What the figures additionally show is what areas each country's military focused on. Being an island nation, Japan has paid attention to strengthening the capabilities of its navy and air force. In the Koreas, however, the army occupies the central role. The relatively high number of heavy tanks and artillery guns in both those countries show that their armies are designed for large field battles and the defense of their borders. The large number of North Korean submarines is due to their high deterrent potential. And the figures also prove all the countries' determination to defend themselves militarily. Still, all this would be meaningless when compared to the mighty US military machine. A look at the country's strategic weapons, including long-range missiles and nuclear warheads, makes it clear immediately. China and the US have such capabilities, unlike South Korea and Japan. North Korea is striving hard to acquire them, but has faced daunting challenges in developing reliable long-range missiles. The US' weapons technology is so far advanced that North Korea hardly has any chance of competing with it on a technological level, observers reckon. "With all the technical considerations, however, one should not forget the mutual vulnerability of North and South Korea," says BICC analyst Bale. About 70 percent of North Korea's ground troops are stationed along the border. And South Korea's bustling capital, Seoul, is just 50 kilometers away from the frontier. "Even with obsolete technology, a devastating attack on South Korea can be carried out with the large number of tanks, artillery and armored personnel carriers."